DAVAO CITY - If you’re familiar with a typical coconut farm, every time coconuts are plucked off, farm workers remove the husks from the harvested nuts and toss them away into big growing piles. These big piles of brown coconut husks are a common sight in a coconut farm, an annoyance to many Filipino farmers who don’t know what to do with them. 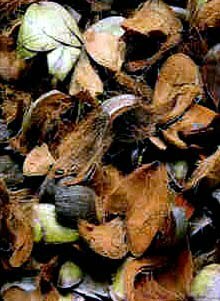 But unknown to most farmers, coconut husk is a source of coco coir, a natural fiber with so many industrial uses in China, Japan, the United States and Europe, especially in factories that make cushioned seats for cars as well as furniture, beds and furnishings. Sounds unbelievable, but this annoying “farm waste” can be worth millions of dollars to our coconut farmers here in the Davao Region, one of the country’s biggest producers and exporters of coconut products like copra and coconut oil. It was against this background that the National Coco Coir Summit was held here in Davao recently, gathering hundreds of coconut farmers, coco coir producers and exporters, etc. from all over the country, finally giving them the attention they deserve. During the early years, Goldelyonn, an import-export agent, got several inquiries from many investors and traders asking our help to look for suppliers of coco coir plant machinery and equipment in Taiwan. “Our small outfit that time got several offers from Taiwanese firms which provided us with factory plans, specifications, production data, quotations, etc. for the production of both coco coir and coco peat, that sawdust-like wastes that comes from processing husks into coco coir. The offers came with free installation by Taiwanese plant engineers, plant testing, engineering consulting, and even low-cost financing,” Goldelyonn said. On the verge to closing a deal, we had a chance of arranging a meeting here with a Davao coco producer and a Taiwanese supplier of coco coir plant equipment at the Harana along Torres Street. Despite an ocular visit by the Taiwanese at a plant site in Panacan, the deal collapsed because a government bank here wasn’t impressed by coco coir export potentials and the feasibility of a coco coir plant in Davao--so a loan application was rejected. “We still don’t know if the Development Bank of the Philippines (DBP) and the Land Bank of the Philippines (LBP) still have a very low regard for the potentials of coco coir and coco peat,” it said. The question is: can a coco coir plant generate enough revenues regularly to be able to pay off millions in loans? Our Chinese contacts in mainland China a few years ago, had been asking us that they needed 50 containers (40 vans) of coco coir every week. This was only one of the dozens of Chinese firms looking to buy coco coir from the Philippines. Each container load of coco coir is usually valued at around a million pesos of export revenues. Most of the coco coir they buy comes from India, Bangladesh and Indonesia which produce huge volumes of coco coir despite the fact they have lesser coconut trees than the Philippines.